42nd Street at the Theatre Royal Drury Lane is a feast of musical theatre. 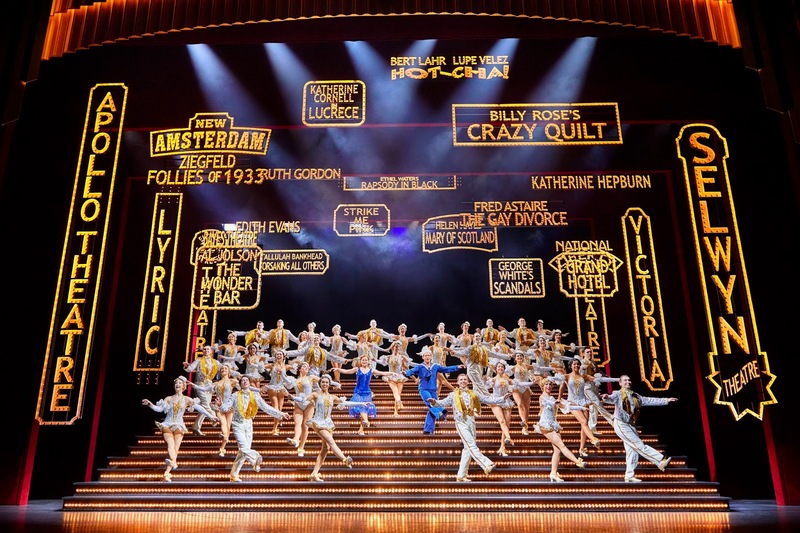 This revival of the 1980s show, itself inspired by the 1930s recession busting movie of the same name, is nothing less than a homage to Busby Berkeley’s lavish Hollywood tap routines, framed around a fairytale of Broadway. Peggy Sawyer is a kid fresh off the bus from Allentown. She's also a gifted dancer who manages to work her way into the cast of Pretty Lady, the latest production being mounted by Julian Marsh, a tyrannical Broadway producer. When ageing star Dorothy Brock crocks her ankle and is unable to continue in her role, Sawyer is plucked from the chorus to replace her. It’s all magical whimsy, surrounded by a handful of comic-book subplots that really don't bear close scrutiny. What makes this show pulse with life is its dance. All credit to the two Michaels, Grade and Linnit, who’ve produced the revival – their 55 (yes 55!) strong company is simply breathtaking. There's barely any (visible) fancy new technology here and no gimmicks at all. Even Douglas W. Schmidt’s scenery is (for the most part) in a refreshingly simple style with hand painted 2D backdrops. It is evident that in this multi-million pound show the producers' money has been lavished on the actors, their sensational costumes and countless pairs of tap shoes. Amongst the featured roles Clare Halse’s Sawyer is just a delicious whirl of wonderful. Her feet defy belief as she works the show’s fiendishly fierce routines, taking us with her as Sawyer comes to realise her dream. Opposite her and with a modest love interest is Stuart Neal’s Billy Lawlor – again fleet of foot, a joy to behold and a beautifully voiced young man. Tom Lister’s Marsh is spared much of the dancing responsibility, but he nonetheless creates a believably driven megalomaniac, with just a glimpse of heart. When his voice finds its pitch, he commands the stage. Making her West End debut, Sheena Easton is Brock. Easton's is a beautiful voice for sure – her I Only Have Eyes for You is a vocal delight – but her acting lets her down, failing to give the shallowness of her character the body it cries out for. If there is but one criticism of director (and writer) Mark Bramble, it is that he hasn’t taken Easton to fully fill the role. No matter, for elsewhere there is acting excellence - as Dorothy Brock's septuagenarian, strung-along sugar daddy Abner Dillon, the always excellent Bruce Montague gives a mini masterclass in musical theatre comedy. Likewise Jasna Ivir and Christopher Howell as Pretty Lady's writers are a well polished double act, while Norman Bowman, as ever, brings perfectly nuanced excellence to the modest role of Pat Denning. But never forget - 42nd Street is all about its song and dance and it's been a long time since a company so large and so perfectly drilled, has wowed a London audience. The classic numbers We're In The Money and Lullaby Of Broadway are joyous - while Keep Young And Beautiful, with the ensemble's Girls horizontal on a revolve as a Berkeley-style mirror is suspended above them to show the ingenious routine, makes it feel like a time machine has brought Broadway and Hollywood's Golden Age to London. And as for the jaw-dropping finale, it is a festival of synchronised genius, a cascade of glitter and light celebrating the beauty of perfectly performed tap. As the world on both sides of the Atlantic cautiously enters a new era, it’s just so refreshing to be shown a full-blooded glimpse of the heritage of happiness that beautifully crafted musical theatre can deliver. Bravo to musical director Jae Alexander and choreographer Randy Skinner. 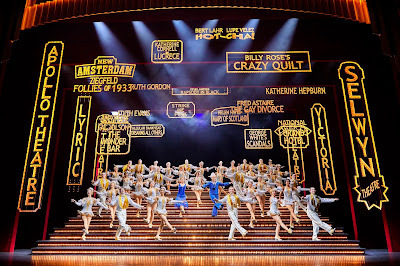 Drury Lane's 42nd Street is the most spectacular show in town!